Hurricane Katrina left tenor saxophonist Kidd Jordan homeless less than a month before this recording session. Undeterred, the New Orleans native kept a prearranged studio date with bassist William Parker and drummer Hamid Drake. Regularly joined by tenor saxophonist Fred Anderson for powerhouse quartet gigs, Jordan, Parker and Drake had never recorded before as a trio. Improvising collectively with no preset material, they settled into a meditative mood underscored by restless energy. It would seem plausible that such turbulent melancholy is at least partially attributable to an emotional reaction in the aftermath of such disaster. While there is no denying the possibility of such an influence, Palm of Soul is steeped in musical traditions that existed long before. Eschewing the vigorous free-bop at which they excel (tantalizingly hinted at on the brisk one-minute opener, "Peppermint Falls"), they elect to explore a panorama of multi-ethnic, rubato rhythms tempered by an undercurrent of simmering introspection. Though it's not without its frenetic moments, this session is primarily focused on mutual conversation, nuanced interplay, exotic texture and rich, resplendent tonality. 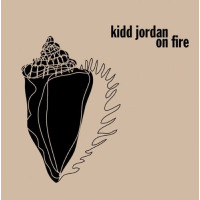 Such a tone belongs to Kidd Jordan. At seventy, his resume boasts innumerable collaborations, from Ray Charles to Cecil Taylor. He conveys years of experience in even the most unadorned of phrases. Supported by a superlative rhythm section, Jordan is able to explore every facet of his horn. Accompanied by shimmering percussion and resounding gongs on "Forever" and "Last of the Chicken Wings," he extracts lissome, forlorn melodies from his breathy, multiphonic tenor. Alternately, he elicits hoarse, cacophonous testimonials on "Living Peace" while Parker bows dissonant harmonics and Drake sporadically accents the ascending drama. Parker and Drake's harmonically rife rhythmic accompaniment is anything but conventional. Parker plays African hunter's guitar (guimbri), gongs and resonating bowls more often than the bass. Drake alternates between traditional trap set, frame drum and tablas. These exotic instruments lend a very strong Asian, African and Indian feel to the majority of the set, invoking none other than Don Cherry, Drake and Parker's former employer. "Unity Call" is especially emblematic of Cherry's pan-global aesthetic. Drake's wordless chanting and loping frame drum rhythm combine with Parker's pulsing guimbri ostinato, driving Jordan into a wailing, raspy frenzy reminiscent of Cherry's work with Frank Lowe in the 1970s. Flirting with tradition, "Living Peace" borrows conventional devices, employing walking bass and a casual ride rhythm that modulates, Mingus-like, from bluesy gait to bop sprint. Building to grandeur worthy of late-period Coltrane, the piece culminates in a burning arco/altissimo finale that is as strident as "Forever" is melancholy and ethereal. With steely determination and emotional resolve in the face of great tragedy, Jordan, Parker and Drake have created a timeless album of understated, dark beauty. Palm of Soul is spiritually revelatory free jazz, hauntingly beautiful and emotionally resonant. Track Listing: Peppermint Falls; Forever; Living Peace; Unity Call; So Often; Resolution; Last of the Chicken Wings. 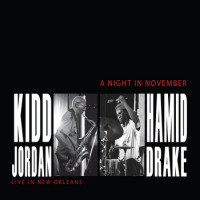 Personnel: Kidd Jordan: tenor saxophone; William Parker: bass, guimbri, gongs, bowls, talking drum; Hamid Drake: drums, tablas, frame drum, voice.